While the ExoMars Trace Gas Orbiter, launched in 2016, began its science mission earlier this year to search for tiny amounts of gases in the atmosphere that might be linked to biological or geological activity, the rover will drive to different locations and drill down to two metres below the surface in search of clues for past life preserved underground. It will relay its data to Earth through the Trace Gas Orbiter. 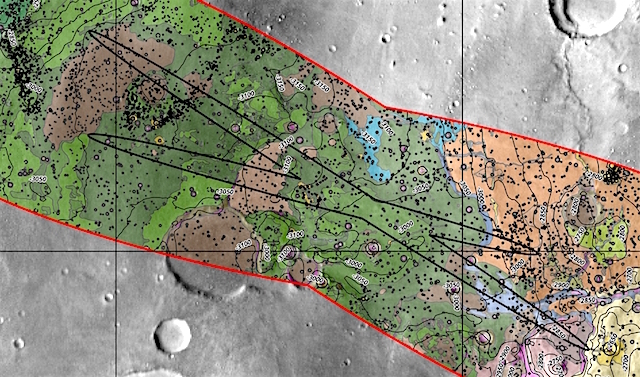 Both landing site candidates – Oxia Planum and Mawrth Vallis – preserve a rich record of geological history from the planet’s wetter past, approximately four billion years ago. They lie just north of the equator, with several hundred kilometres between them, in an area of the planet with many channels cutting through from the southern highlands to the northern lowlands. Since life as we know it on Earth requires liquid water, locations like these include many prime targets to search for clues that may help reveal the presence of past life on Mars. This entry was posted in Reports and tagged ESA, European Space Agency, ExoMars, ExoMars 2020, ExoMars 2020 rover, Mawrth Vallis, Oxia Planum, Roscosmos, TGO, Trace Gas Orbiter. Bookmark the permalink.